Today, instead of taking a look at WordPress themes for specific vertical industry, we will take a look at the best cheap WordPress themes, and the best ways to get a great look for your WordPress site for under $20. Many people get started WordPress have a business or other type of site that they want to promote, and they don’t have a lot of money to do it. Of course, you can use the free themes included in WordPress, or you can use one of the open source themes available online. But most of those are extremely basic, and they seem rather old and obsolete by today’s web standards. In addition, if you use one of the free or open source themes, you often have to include a credit to the original author, which, if you have a business, can look a bit unprofessional. So what are your options? It turns out there are many options. In fact, there are hundreds of themes available for WordPress that are extremely cheap but look professional. In addition, there are ways for you to get a custom WordPress theme for $5 . Let’s get started by defining what we need in theme. We want something that is relatively new, and conforms to the latest standards. Especially important these days is a theme that is responsive, and can be used on both mobile and desktop. Given that Google is moving its index to mobile first over the next year, it’s important that the theme be as functional on mobile as it is on desktop. The second thing we need in a cheap WordPress theme is compatibility with the latest web technologies. We don’t want a theme that includes flash or some sort of old functionality. Also, we want to make sure our theme makes appropriate use of live Ajax functionality, and preferably is customizable in some way. In this rundown, we will take a look at several generic themes, which can be used for any type of website, but we will also take a look at some specific themes for common types of businesses and organizations. So here we go, our list of the best cheap WordPress themes. We start off with generic themes, that can be used for anything, and then move to more industry-specific themes. Our absolute favorite WordPress theme under $20 is called Deep… But Deep is far more than just a theme. Deep is actually an entire template design and customization system in a box, and it includes several plug-ins as well as multiple predesigned looks, which you can tailor and customize to suit your requirements. When you get started with Deep, you have multiple different designs to choose from. 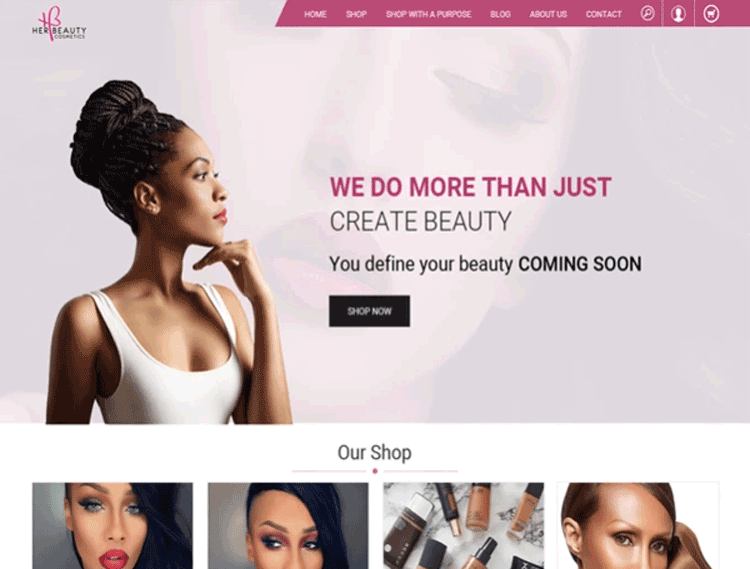 You can choose from a corporate look for business websites, a shopping look for web stores, a magazine look, a portfolio look, and dozens of others. But that’s only the beginning. Once you’ve chosen a look, you have thousands and thousands of different possibilities for customization. 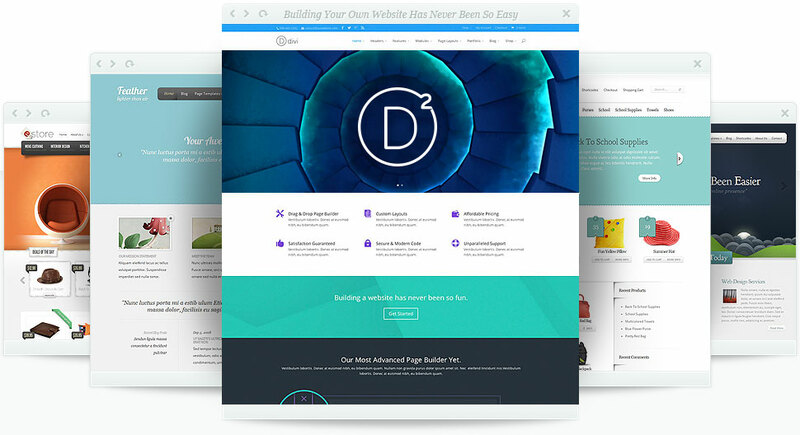 Deep includes an absolutely amazing visual page builder, which allows you to essentially drag-and-drop and design your individual pages, down to such customizations as scrolling animation, CSS, and flip boxes. Additionally, for each page, you get a selection of 160 different section templates, from which you can build exactly what you want. Some of the other features of Deep include a shopping site module, with complete e-commerce functionality, adaptive images, animations and other widgets, and even a template importer. If you have a site that doesn’t fall into one of the specific categories below – or if you’re not sure exactly how you want your site to look, and you want years of customizability – Deep is your top choice under $20. It easily compares to themes costing 3 times as much. If you’re looking for a simple and straightforward theme that can be used for almost any website, and doesn’t require a lot of customization in order to look good, check out Struct. 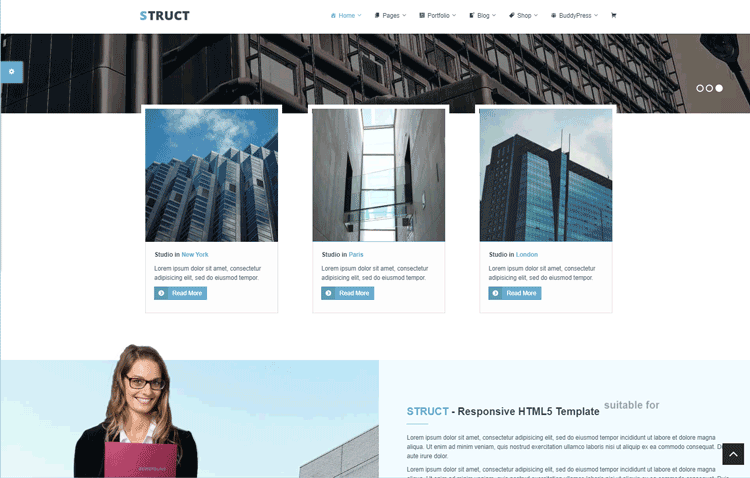 Struct is our runner-up for best cheap WordPress theme, and at $17, it’s a huge steal. Unlike Deep, Struct doesn’t have a huge number of customization options, but it has just enough to make your site stand out from others that may use the same theme. You can choose things like colors and fonts, and you can edit menus and other widgets, but you don’t have to do anything to make it look great right out of the box. Struct is best for sites that don’t have a huge amount of content, such as small business websites, portfolios, start ups, and smaller e-commerce sites. Although it works great for large sites as well, the design lends itself to less dense sites, making it a great alternative to some of the other themes listed later in this article. WPeka isn’t a single theme, but a set of themes, which you can get for $17. That’s right, WPeka offers a set of almost 30 different themes at the price of $17 per month. But what’s awesome is that you get to keep the themes and use them on unlimited sites forever, even after you cancel the subscription. So you’re essentially getting 30 themes for $17. 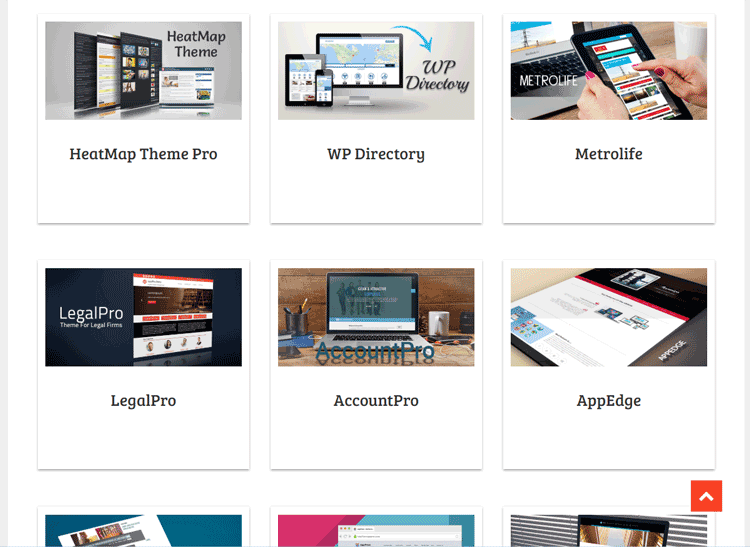 WPeka includes themes for law firms, directories, accounting firms, apps, magazines, startups, real estate agents, car dealers, local shops, and of course plenty of themes for blogs and portfolios. Future Magazine is a beautiful, clean, and responsive design for magazines and WordPress. However, what we found great about Future Magazine is that it is applicable not only to magazine WordPress sites, but all kinds of other sites. 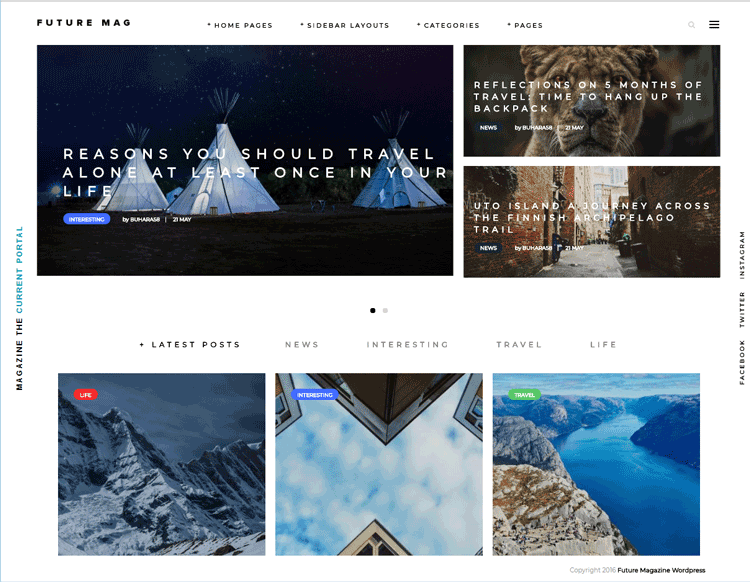 This cheap WordPress theme costs only $19 and includes multiple homepage options, multiple detail options, and six months of support. The look is modern and very high quality, and it easily mirrors something that you would see on one of the top magazine websites on the Internet. One thing to note, however, about this theme is that because it’s designed like professional news website, it requires a lot of content in order to look as good as it does in the previews. That means, if you don’t have much content on your blog or WordPress site, you will want to either fill out the content, or choose a different theme, such as Struct (above). At $13, Aden is the cheapest theme in this rundown, but by no means is the quality reflective of the price. 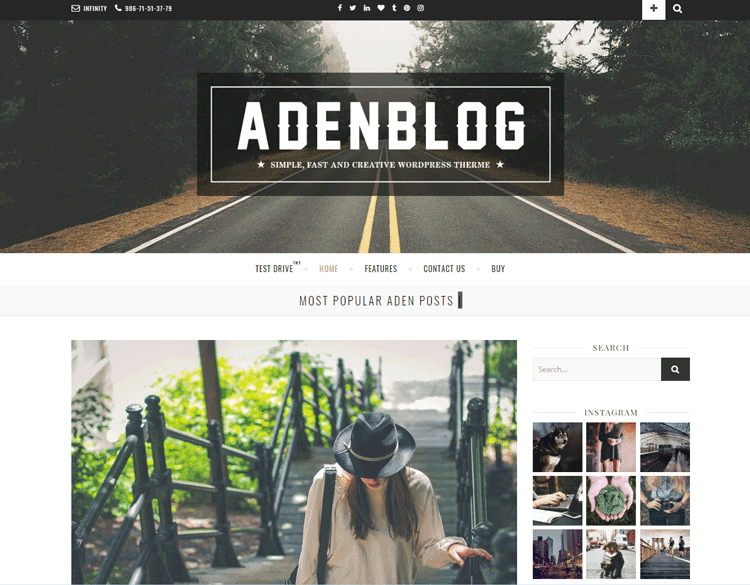 Aden is a beautiful theme for either a blog or a news site, and it combines a professional look with simplicity. Aden is very simple to install and use, and it requires little to no customization in order to make it work well. The theme supports standard posts, as well as quotes, links, audio, video, and galleries. Some of the parts you can customize include the colors, the carousel, the CSS, and the header/footer. 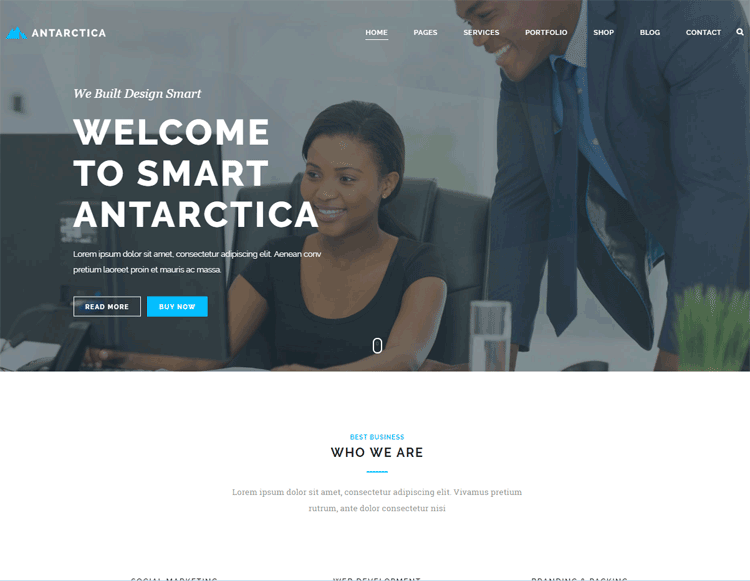 Our favorite cheap WordPress theme for startups (as well as mature businesses) is the timeless and elegant Antarctica theme. If you want a business site that looks as elegant as your work, this is definitely the theme. 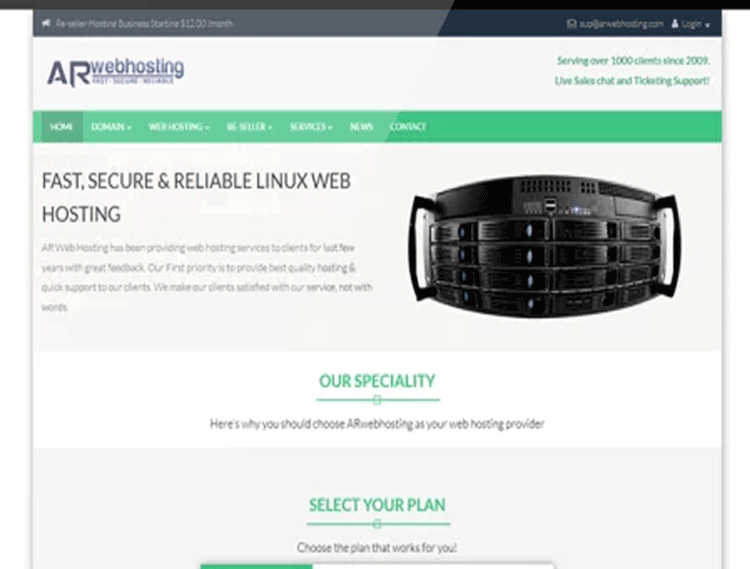 The Antarctica theme looks very standard for a startup/business website, so if you want something very unique and different, this may not be the best theme for you. However, it looks extremely clean and well designed, and we guarantee you people will mistake it for a custom theme that cost $5000. With Antarctica, you get five different types of homepages, as well as a visual editor and cons of customizable options. The theme consists of all the standard pages that you would need for start up, like team, blog, contact us, and partners. The best thing about Antarctica? It costs only $19, and includes six months of support. 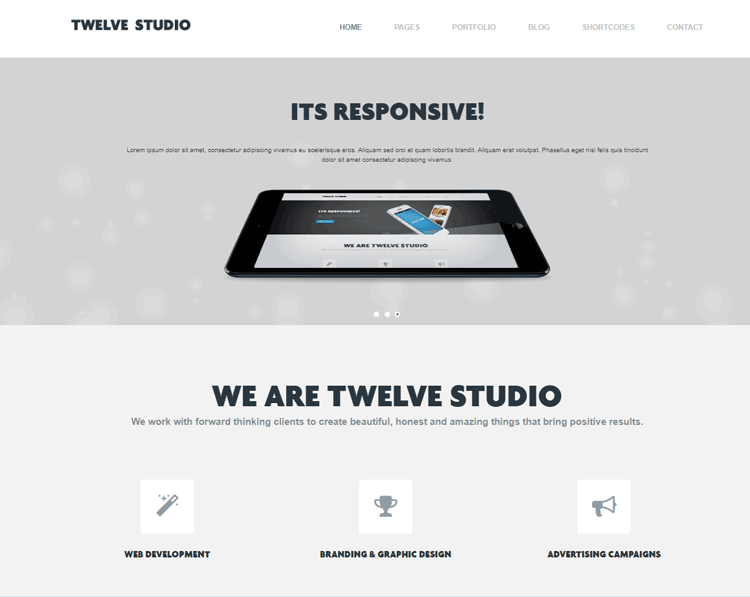 Another great cheap WordPress theme for businesses and startups is Twelve Studio. This responsive theme looks great, and has big, inviting colors and fonts. We would suggest using this theme for an app website, an ICO, or a consulting business. What’s most enticing about Twelve Studio is the big billboard at the front, and the nice clean look and feel of the theme. The theme contains standard pages for a blog, contact us, and a portfolio/gallery. The best thing? It’s only $19. 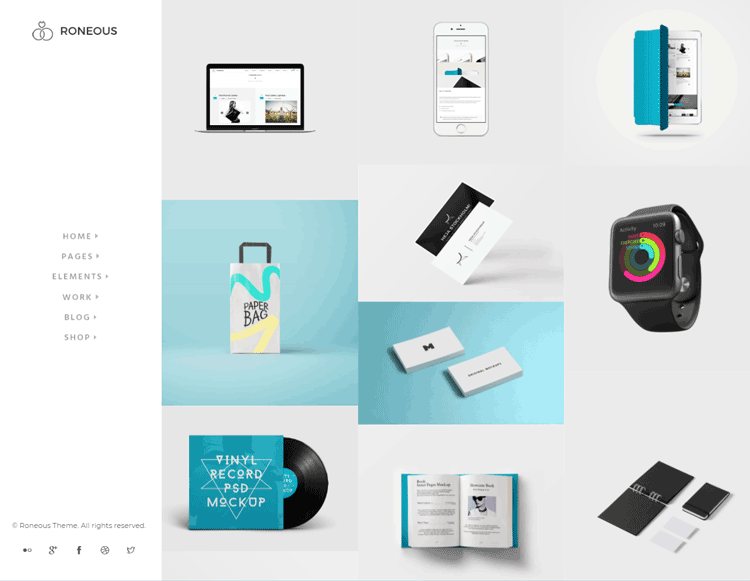 Roneous is a theme that has a lot of customization options, and it can be used for everything from portfolios to app sites. But what it’s best for is portfolios and creative sites. If you have a portfolio, or you want to showcase your band, design, or art, this is an excellent theme option. At $16, Roneous is much cheaper than similar themes with the same features. It includes a visual page builder, 30+ custom elements, and plenty of examples (which you can build upon). There are specific included layouts for interior design, musicians, apps, magazines, freelance designers, and ecommerce stores. All of the themes listed above are great, and will make your site look extremely professional. But the fact is, there are other people using them, and you don’t have something that’s totally tailored to your needs. Image credit: Fiverr/ellen_watsonIf you don’t have something to convert, and you just want a theme from scratch that is custom, you have several options on Fiverr. From our experience, one of the best is this seller, who will do 5 pages for $50. The look will be custom to your style and site. We found the themes created by this seller on Fiverr to be excellent quality, and they look just as good as many of the themes that we have listed above. However, what’s great is you will have a unique theme, and no other site will have it. And you can provide input into what you want to see in your theme. So for only a few dollars more than a cheap theme, you can have your own theme, made just for you. On our opinion, this is definitely worth a try. If you have an old HTML website, and you want to start using WordPress, but you would prefer to keep your current site look, you can turn your current HTML site into a complete WordPress theme for around $150, depending on the number of page templates. It’s a great way to have your own, totally custom look for less than the cost of some themes. There are several providers on Fiverr who will take your Photoshop PSD and turn it into a WordPress theme, which you can install on your site. If you have a graphic designer who has created a graphic design and look that you like, and you just need it turned into a WordPress site, this is a great option.